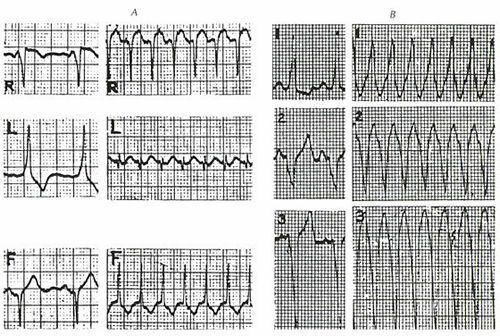 Wolff-Parkinson-White syndrome with reciprocating tachycardia. A. Before and during an orthodromic (using the anomalous pathway to enter the ventricle) tachycardia with a narrow QRS pattern (most common). B. Before and during an antidromic tachycardia with wide QRS's characteristic of fully pre-excited impulses during sinus rhythm. Myerburg, R.J., MD, Kessler, K.M., MD, Castellanos, A., MD, Recognition, Clinical Assessment, and Management of Arrhytmias and Conduction Disturbances, Hurst's The Heart, 8th edition, p 705-758.